Today was a fairly easy day. Another day of pure road walking from Bulls to Fielding. The main mission of the day was to reach Fielding and just beyond before forecast heavy rains commenced in the afternoon. Checking the forecast last night I was expecting to be walking in light to moderate rain all day towards Fielding but it never came. It was quick walking on the backroads with very little traffic for the most part. It was early and a Sunday which may have been part of the reason. 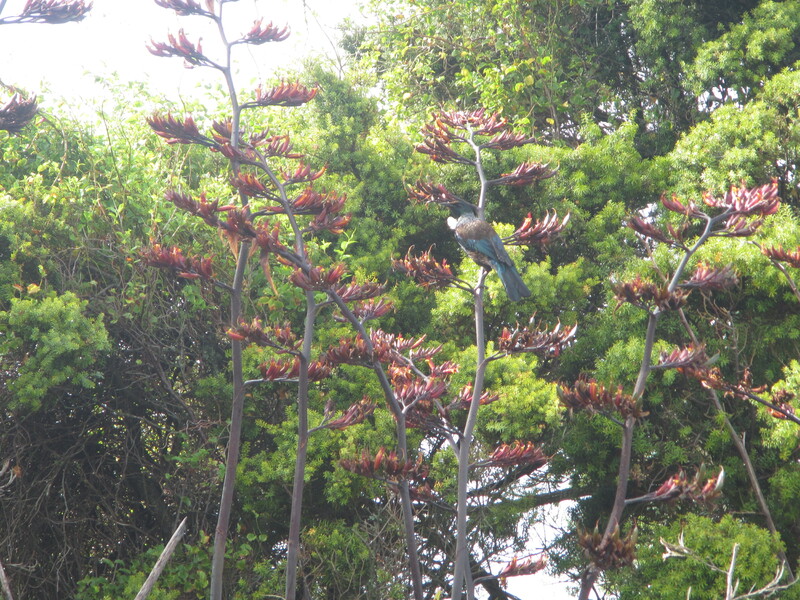 I reached an Airforce radar station around 6 km and pulled up for a short break, entertained by a Tui jumping from flower to flower. Turning onto Ngaio Road and Stewarts Road the traffic increased a bit but all drivers were great, pulling well into the middle of the road to give me some space. The trail is welled marked through the back blocks here with directional arrows on just about every corner which made for easy navigation. I reached Fielding around mid day and spent a couple of hours having a lesuirely lunch and coffee in town. By far one of the biggest highlights of my trip thus far was the absolute generousity and kindness of a complete stranger and blog follower, Arran. Arran emailed me a week or so ago saying that if I was passing through Fielding I was welcome to call through and stay. I took him up on this offer and made arrangements to walk through Fielding and get picked up at the start of their road as the property was 6km off trail. Talk about timing. I’d left Fielding enroute out of town as the drissly rain started to settle in. The wet weather gear was on but not needed for long. Around 2km out of town, Arran drove past on the way to the shops, saw me and stopped to picked me up. 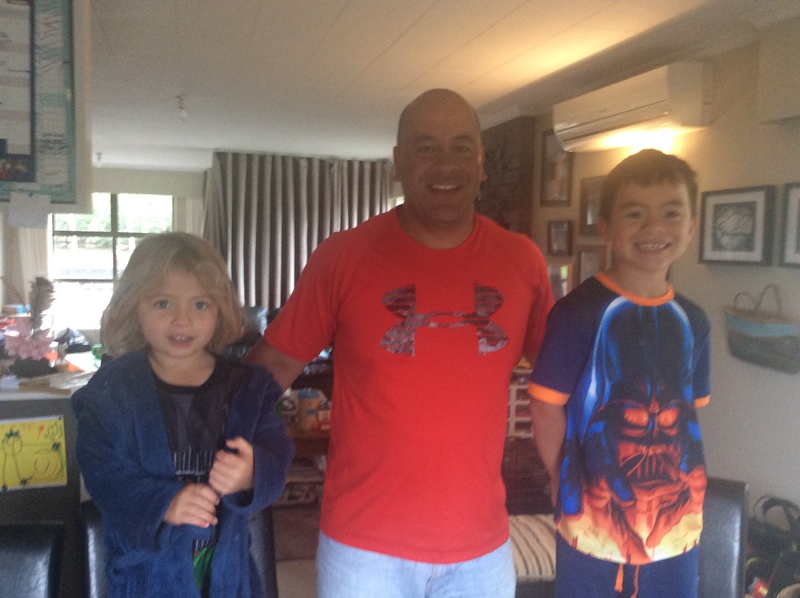 What a pleasure to meet such a genuine Kiwi bloke and later his family. I was welcomed into the family home like a family member and made to feel right at home. Perfect as the rain started to belt down outside. Later I met the rest of the gang as they returned home from the movies, young Lenny (8yrs) and very inqusitive Oscar (4yrs), as well as Mia (14) and Arran’s wife Poppy. I was expecting to pitch my tent in the back yard and perhaps be able to have a warm shower but I was treated to so much more. A pork roast dinner with pudding and hokey pokey icecream for desert; a couple of beers; warm shower and a soft warm bed to sleep in. So much more than I could ever wish for and completly unexpected. The kindness of Kiwi’s has been a highlight of the Te Araroa right the way through. I spent the afternoon making use of unlimited wifi to update photos and my blog; and being entertained by the lively young fellas, playing heaps of games and answering many, many questions they had about absolutely everything. They were great and it was fun to get a kid fix for a while, reminding me of my many young nephews. To top my stay with Arran and his family off, I slept like a log, got to have a sleep in and was treated to a breakfast of bacon and eggs. Thankyou so such guys!! Your generosity was very much apprecaiated.